Measurements: 3.95 x 5.9 inches, or 100 x 150 mm. Very large. Back of card: A solid red field. Slightly off-center, to the right, a large image of the sun, as we used to see on old bank calendars, printed in yellow-orange. Not symmetrical by any means (the right side of the sun runs off the edge of the card), so not for inversion. Book included: Yes, hardcover, 96 pages. Color illustrations throughout. Measurements: 5.5 x 6.5 inches, or 140 x 165 mm. Title: The Destiny Tarot, An Illustrated Guide to Interpreting the Tarot, by Jane Struthers. Publisher: Collins & Brown, London. Distributed in the US by Sterling, New York. Printed in Hong Kong, bound in China. Comments: A nice large deck of cards, a hardbound book, a very sturdy box (6 wide, 7 high, 2 thick, in inches, or 150 x 173 x 50 mm), all for $19.95? I had to look twice at the price. This is what happens when a major publisher does a deck. They print thousands of copies & get a very low per unit cost. So take advantage. The deck itself is basically a jazzed-up version of those two old standbys, the Marseilles (minor arcana & some of the major arcanas) & Rider-Waite (major arcana & court cards) tarot decks. This is disappointing, but may have made sense from a business viewpoint. In addition, each of the major arcana cards has an astrological sign on it, though on some cards they're not all that clear. Speaking as an astrologer, I'm not much of a fan of putting astrological symbols on tarot cards, since they don't really fit. 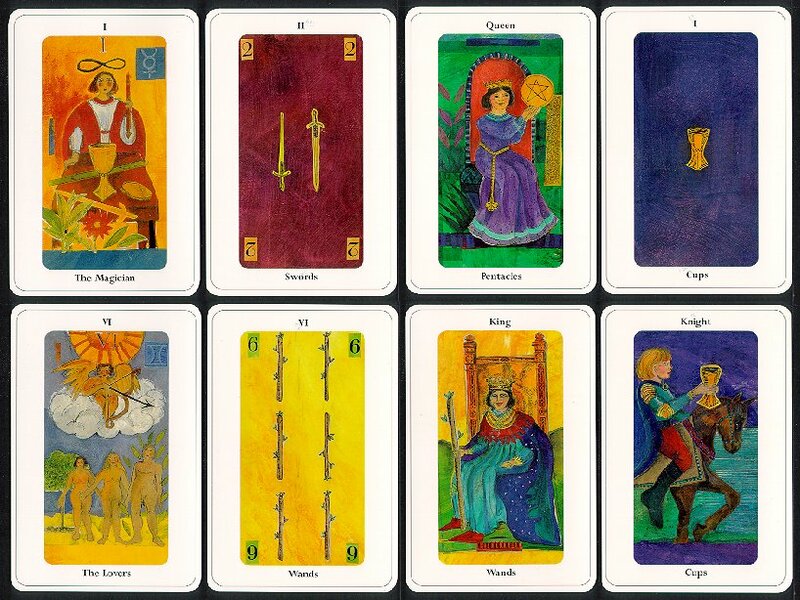 There's 22 major arcana cards but only 12 astrological signs. So which signs are duplicated, and why only those? A handful of cards have long had astrological associations, the High Priestess (Gemini) & World cards (Taurus, Leo, Scorpio & Aquarius) chief among them. Of course, astrological signs are widely known & there is no harm in their inclusion.